This paper examines the issue of unaccompanied minors arriving in Italy and how Italy has responded to their need for protection. It contains five complementary sections. Section 1, authored by Pietro Demurtas, provides a statistical overview of unaccompanied minors in Italy between 2014 and 2017. In particular, it discusses unaccompanied minors who request political asylum, those in government reception facilities who do not, and those who have left reception centers without seeking asylum and have become “untraceable.” The second section by Mattia Vitiello addresses why unaccompanied minors leave their countries of origin and how they transit to Italy and elsewhere. This section highlights the role of families in the decision to migrate and the migration process. It distinguishes unaccompanied minors who largely seek to “escape from” particular conditions from other migrants who are in search of a better life for themselves and their families. The third section by Marco Accorinti covers Italian reception policies and policymaking challenges, with a particular focus on implementation of Italy’s System for the Protection of Asylum Seekers and Refugees. The section argues for reception procedures and interventions that are tailored to the particular vulnerabilities and needs of unaccompanied minors. Section 4, authored by Aldo Skoda, c.s., offers a psychosocial analysis of the phenomenon of unaccompanied child migration. It describes strategies to build the competencies, sense of agency, and resilience of unaccompanied minors. The final section, authored by Carola Perillo, details the demands and requirements of acting in the “best interests” of unaccompanied minors. It ends by setting forth minimum principles of protection for unaccompanied minors, which should inform both the Global Compact on Migration and the Global Compact on Refugees. Of all the migrants that have crossed the Mediterranean Sea in the last few years, children have been the subject of great attention because a large number of them are unaccompanied minors (UNAMs). From January 1st to November 30th of 2017, 15,540 minors arrived in Italy unaccompanied by an adult responsible for them: 25,852 arrived in 2016, 12,360 in 2015, and 13,026 in 2014 (Figure 1). In order to limit the influx of entries by sea, in the summer of 2017, Italy introduced a code of conduct that limited the scope of action of nongovernmental organizations providing rescue and relief, and which led Italian ships to flank the Libyan Coast Guard. Statistics from the UNHCR (2017) demonstrate the consequences of such measures: by the end of June 2017, the number of migrants reaching the Italian coast exceeded that of 2016 (+19 percent), while subsequently there was a reduction of -68 percent by November 30th. However, despite a small decrease in the number of unaccompanied minor arrivals in comparison to 2016, the number of arrivals in 2017 was still higher than in 2014 and 2015. Recently, there has been a decline in the number of Eritrean minors arriving in Italy; meanwhile, there has been a definite increase in the recent years of those arriving from West Africa (in particular, Guinea, the Ivory Coast, and Gambia). This goes hand in hand with a large number of young migrants coming from Bangladesh (Figure 2). To better understand the situation of these young persons in detail, on the basis of the statistical data, a distinction can be made between those who request international protection and those who do not. In 2016, Italy was the second most popular destination among the European Union (EU) countries for unaccompanied minor migrants, with 6,020 applications for asylum; the most popular EU member was Germany, with 35,935 requests. Figure 3 illustrates the countries of origin of unaccompanied minors requesting asylum in Italy. It demonstrates an increase in requests for asylum from African minors, particularly those from Gambia, Nigeria, Guinea, and the Ivory Coast. Statistics from 2016 reveal that many of them are on the verge of reaching the age of 18; in fact, 16- and 17-year-olds constitute about 93 percent of the total. Furthermore, boys and young men constitute the majority (95 percent of the total), although there are some nationalities in which girls and young women constitute a much larger percentile. In the case of Nigeria, for example, females represent approximately 23 percent. In Italy, unaccompanied minors applying for asylum and those entitled to international and humanitarian protection find refuge in reception centers under the System for the Protection of Asylum Seekers and Refugees (Italian: Sistema di Protezione per Richiedenti Asilo e Rifugiati [SPRAR]). Statistics show that 2,898 unaccompanied minors were accommodated in reception centers in 2016; 1,640 in 2015; and 1,142 in 2014 (SPRAR 2016, 2017). A majority of these cases were minors requesting asylum, but in the recent years the percentage of these minors has decreased: in 2014, asylum seekers constituted 85 percent of the population while in 2016, they represented only 46.8 percent. 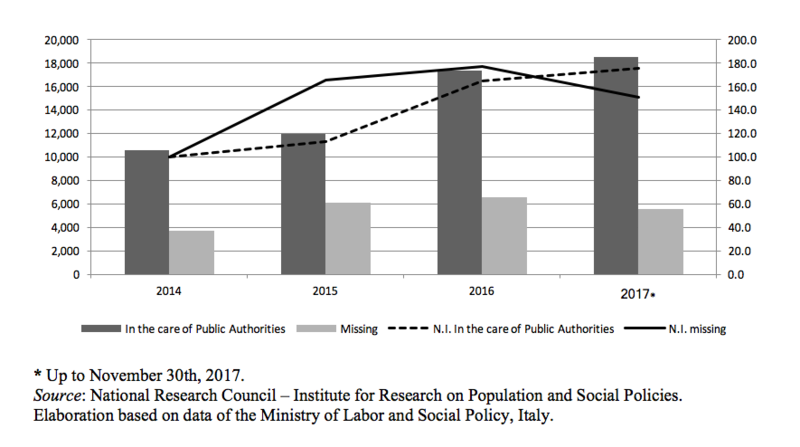 In Italy, the latter category constitutes a substantially large group of persons, but only recently have things moved towards a single reception system, capable of overcoming disparity in treatment of minor migrants requesting asylum and those who do not (this was done earlier with the passing of Law 190/2014, and subsequently with Law 47/2017). Unaccompanied minors arriving in Europe without a residence permit and not applying for asylum are considered irregular migrants by most EU member states. This explains the lack of official statistics regarding these minors (EMN 2015, 2016). However, Italy has developed a reception system that provides support for unaccompanied minors. Generally, this work falls to the Ministry of Labor and Social Policy, which registers their presence and provides statistical data on them. On the other hand, these migrants are not always interested in or have the possibility of entering into the Italian reception system and therefore remain undetected. In other cases, unaccompanied minors decide to voluntarily leave the reception system, which is perceived as being unresponsive to their migration needs and, in this way, they elude the system. Of those uninterested in entering the system, there is no further information regarding them. For those who distance themselves from the system, the meeting/clash with Italian institutions leaves behind a record of their presence. Therefore, they are counted among the official statistics. 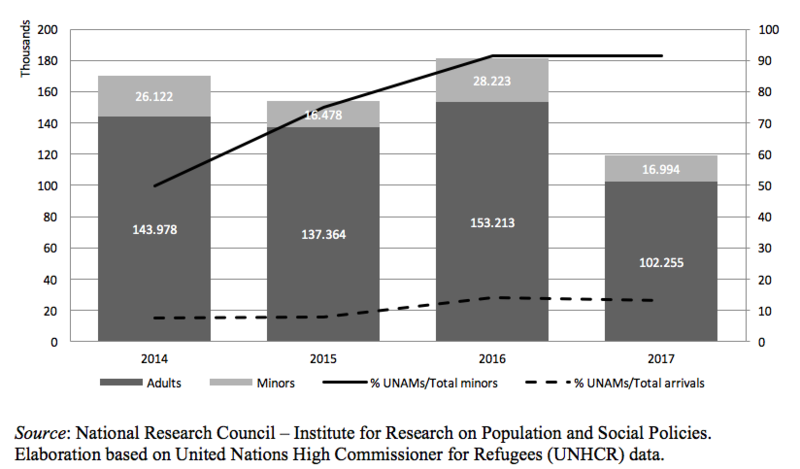 Over the last several years, the number of unaccompanied minors in reception centers has increased, albeit at a slower rate in 2017 than in 2016 (Figure 4). In 2015, the number of persons who left these facilities and can no longer be traced increased, followed by a smaller increase in 2016 and a decrease in 2017. The most recent decrease can be explained for two reasons: first, that database procedures periodically eliminate migrants who have reached the age of 18 from the system; and second, there has been a decrease in the number of persons arriving at centers in the last year. As of November 30, 2017, unaccompanied minors in reception centers not seeking asylum were mostly between 16 and 17 years old (83 percent), and the majority of them were male (93 percent). However, it should be noted that young women and girls – although a minority — are particularly at risk: 43 percent of the girls in the centers are Nigerian, and have been considered in the past of being at risk of sexual exploitation (UNICRI and PARSEC 2010). 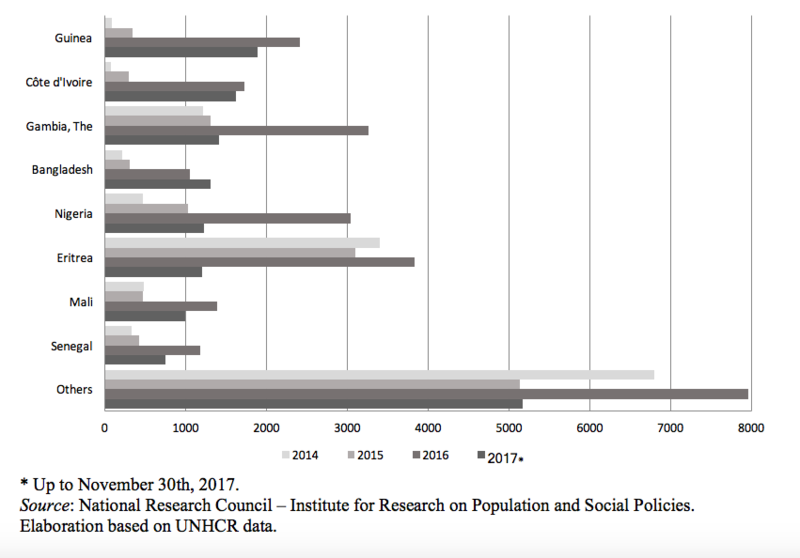 Regarding the total number of those present in reception facilities, Figure 5 illustrates that, in recent years, migrants coming from Egypt were the largest group but, as of 2017, those coming from countries in West Africa (particularly Gambia and Guinea) have become the majority. It is an open question why minors have left reception centers and not sought asylum. It is possible that they are directed to other European countries, or that they consider the reception programs a restraint to their plans, i.e., they may have more urgent needs of a financial/economic character. 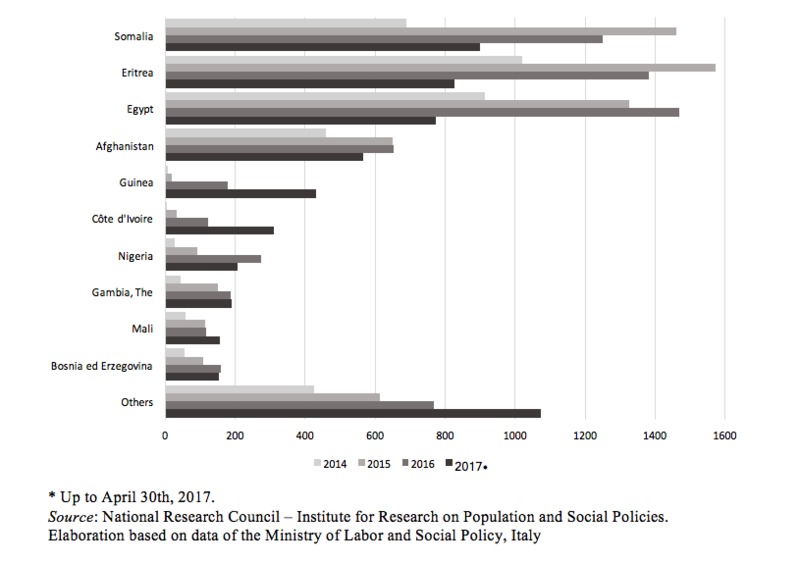 The data available makes it possible to observe a large number of Eritrean, Somali, and Afghan nationalities, which are particularly represented among asylum seekers in other EU member countries (Figure 6). Unlike the Egyptians, who are often seen as economic migrants, it is plausible that the minors coming from these countries have disappeared in order to continue their migration to another country, with the intention of presenting a request for asylum in another EU member nation, thus evading the Dublin Regulation requirements. The profiles of unaccompanied minors set forth in sociological literature focus on their motivations for leaving home and the vicissitudes of their travels. For example, there are references to exiled young persons, those sent on the journey by their parents, those who run away, or those who are exploited or are itinerant (Etiemble 2000). Others are attracted to the lifestyles promoted by mass media. Some are driven away by the social decay in their countries of origin (Giovannetti 2008). Additional considerations — raised by qualitative research — will be discussed below. The decision to leave one’s family and social context is not an easy one. Neither is the decision to permanently leave behind the affective and social relationships that accompanied an individual’s emotional and physical growth (cf. interviews in CNR-IRPPS and UNICEF 2017). It is not the fruit of a simple decision made in solitude, but the result of discussion and confrontation with family and loved ones. Most of the time, it is the first step in the family’s strategy to meet arising needs, to be able to escape a crisis, or to improve their own situation. But even in these cases, the choice is not made through a simple rational calculation of the costs and advantages of such a decision. There is always an element of emotion, derived from everyday life, which imposes an emotional burden and often acts as a decisive influence towards the decision to migrate. This complex system takes an even more intricate form in the case of unaccompanied minors. The migrant’s families often play the decisive role not only in the decision to leave, but also in preparation for the journey, and in the choice of destination. But it is also true that, in many cases, the family may play a minimal role, if not a negative one, in that they may be central to the situation that the young person wishes to escape, or may be the principal factor for migrating. Socioeconomic change, caused by unequal or poorly managed development, can be a migration push factor. Often, low- and middle-class families are overwhelmed by such changes and cannot adapt to the new situation. In such a scenario, the family and the family bonds and surrounding settings can assume a fundamental role in the migration decision. The child’s departure is seen as an investment and the success of the migratory project represents an accomplishment and the social promotion for the entire family. The family often chooses the eldest son, who most likely has already finished the obligatory schooling and whose study can no longer be sustained. Such a migratory model of minors can be called the “in the search of” model. First, it is strongly characterized by the desire to work. In these cases, to have a job means to earn, to be autonomous, and to be able to help the family. A certain agreement can be observed between the parents and child regarding the undertaking of such a migratory project, presented in terms of an “investment” (of the parents) both financially and affectively, and a source of hope for the entire family. These are families who are trying to adapt to social and economic changes, and who are only able to do so and remain together through a strategy of coping, which anticipates the emigration of one of its own members. In other words, to escape the process of destitution and disintegration, the family invests one of its own members onto the path of migration. In this way, minors come to the decision to leave their homes, in agreement with their parents, near the age of 16, i.e., at the end of their obligatory scholastic preparation. For many of the minors interviewed who arrived in Italy, the choice of the country of destination was made by taking into consideration geography, as well as the past history and present situation of Italy. The Italian Republic is located in the Mediterranean Sea, and found in the midst of three different continents (Europe, Africa, and Asia). Italy is seen as a bridge, since it allows migrants to pass from one continent to the other. There exists a widely diffused “know how” of how to reach the peninsula, just as there is a broad knowledge of the various routes. The offers of passage to Italy are as vast as the Mediterranean Sea. This keeps the cost of the journey manageable. It is a rational choice based on the relation between resources and goals, and a calculation of cost and opportunity. There also exists a different type of migration model of unaccompanied minors whose departure is seen more in the terms of “an escape from.” Such an escape can be understood as a search for better opportunity but, as is in many of these cases, the strategic dimension of investment is lacking. This is not a decision made through rational choice, but rather the decision made in order to escape a specific situation or family difficulty, in order to run away from a realistic and genuine danger. Here, the arrival in Italy is most often the fruit of circumstance rather than conscientious choice. The conditions, aspirations, and objectives that give rise to migration by unaccompanied minors suggest that their migration is often forced. These conditions range in a continuum between those leading to economic migration and those creating a need for international protection. Elements from both realities mutually intertwine. The migrants in this second (economic) model differ from those of the first because difficult relations and economic deprivation essentially mark their family situation. In this context, the family loses the ability to adapt to changes beyond their control and to plan for the future. And it is in such a situation that the child’s departure is not only practical, but also preferable and, as such, is implicitly accepted by the entire family. For the young person, running away from such an unbearable home situation is the lesser of two evils; meanwhile, for the family, it is one less thing to worry about — if they are even worried about it, at all. It is a solution accepted by everyone with relief. It must be emphasized, however, that the choice of migration in this case is an escape rather than a departure, and the choice of destination is always a neighboring country. The choice of Europe or Italy as the ultimate destination of emigration is slowly demarcated as the journey continues. The journey (that is, the route undertaken by migrants to reach their destination) assumes an important role in what will happen after arriving in the final country of destination; even if, among all the events that constitute the various links in the chain within the migratory process, the journey itself is seen as the least important. Among the many factors that play a role in the configuration of the journey, the number of border crossings is probably the most significant. The more border crossings the journey contains, the greater the chance of being caught. In addition, more border crossings mean an increase in the number of mediators or passeurs necessary to make the journey. Therefore, the price of the journey and its risks increase in relation to the number of border crossings and the specific countries that the migrants find themselves in and which they must cross during their journey. The length of the border and the points of crossing render the migrant vulnerable and exposed to violence, abuse, exploitation, and human trafficking. The journey can itself be seen as a vulnerability and can increase one’s defenselessness, especially that of minors. Within the migratory model defined as “an escape from,” the potential vulnus that the journey itself can have on a minor is profoundly significant. The events and the experiences of the journey itself lead them to choose Italy as the destination of their journey without it being the exact destination of choice of the minors. More often than not, they would never have considered such a possibility since they generally have little knowledge of the Italian Republic. For example, the long journey of child migrants from West Africa is often fragmented into shorter segments, defined by destination cities in which they pass from the hands of one passeur to another. The names of these cities recur in the various accounts and reflect the routes already undertaken by other travelers. During the crossing between Niger and Libya, for example, child migrants are completely at the mercy of border control officers, who are often inclined to corruption. These stops in the journey are the longest, and their duration is dependent on factors beyond the minor’s control, and even beyond the control of their guardians and passeurs. During these stops, the child often must work in agriculture or other services. It is probable that, for this reason, the duration of a migrants’ stay in Libya keeps getting longer, as it probably plays a role in the functioning of the country’s economy. Such long stops in the journey between one destination and another, spent in countries such as Libya where there are no well-defined laws and the “survival of the fittest” seems to be the dominant law in effect, are often filled with violence and exploitation that are constitutive elements in the experience of the minors interviewed. For a child, even a few months spent in complete affective and existential precariousness can never be seen as a simple parenthesis in their lives, and neither can the weight and burden that these months have on them at such a young age. Dramatic events, such as the death of a father in Libya during a theft (which left a 15-year-old accompanied minor alone), or the loss of a brother companion forced to climb into another car solely because there was no room and who was never seen again, are the kinds of events that shape the migratory journey. The reception of unaccompanied minors in Italy as of 2017 closely tracks the series of institutional interventions set forth in the National Plan of Action to Face the Extraordinary Flows of Non-EU Citizens, Families, and Unaccompanied Minor Migrants (Piano nazionale per fronteggiare il flusso straordinario di cittadini extracomunitari adulti, famiglie e minori stranieri non accompagnati) and approved by the Unified Conference, an Italian legal institution, on July 10, 2014. The last three years, in fact, have been characterized by a new approach in reception: The Ministry of the Interior is responsible for organizing the reception process regarding unaccompanied minors, surpassing the way previous legislation distinguished unaccompanied minors seeking asylum from those not seeking asylum. (4) Boost and finance the second level of reception of all unaccompanied minor migrants in the context of SPRAR, extending them the possibility of receiving training or professional education. The system, confirmed by Law 142/2015 and more recently by Law 47/2017, specifically concerns unaccompanied minors, and attributes and strengthens the role of the Ministry of the Interior in the governance of unaccompanied minor migrants. Previously, this role was given to the Ministry of Labor and Social Policy. Among other things, the Ministry of Labor and Social Policy financed reception centers, and is still responsible for the Information System on Minors that monitors their presence and tracks their movement and location in Italy. Despite this change, the reception process is still not fully structured or well-defined. At the end of 2017, the system had 1,000 spaces available for the first reception: these can be found in 70 structures financed by the Asylum, Migration, and Immigration Fund (Italian: Fondo Asilo Migrazione e Integrazione [FAMI]) of the Ministry of the Interior. It also had more than 2,000 places for the second phase within the System for the Protection of Asylum Seekers and Refugees network. 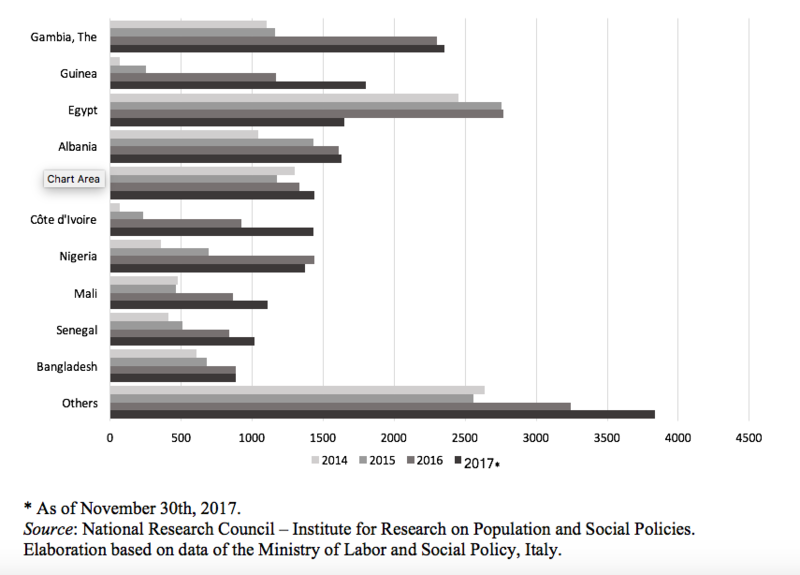 Such numbers do not allow Italy to approach the current migration phenomenon from a strategic perspective, but rather force all stakeholders to resort to emergency procedures, which generally are ill-governed, heterogeneous, and financially inefficient. According to statistics provided by the National Association of Italian Cities (Italian: Associazione Nazionale Comuni Italiani [ANCI]), the majority of minors are received into facilities affiliated with local municipalities, rather than facilities organized within the System for the Protection of Asylum Seekers and Refugees. From a social policy standpoint, this type of approach is heterogeneous, even if participants adhere to uniform procedures regarding “admission,” appointment of the guardian, reporting to competent authorities, requests for residence permits, assessment of age, and contact with the family of origin (cf. Giovannetti 2016; Giovannetti and Accorinti 2017, among others). The difficulty in identifying a single model of intervention lies in the strong dynamic and continuing evolution of the current migration phenomenon, as well as in the various approaches structured at the local level. Such approaches are more dependent on the relationship and interaction of the actors involved in the care of the minor, rather than being determined by protocol and common methods. Governmental facilities have been modified. Above all, the various Italian governing bodies have sought to approach the phenomenon by conforming to the existing system for unaccompanied minors requesting asylum. They have created a specific structure within the Ministry of the Interior, and required the prefectures to open 70 facilities of an “extraordinary” character (the so-called “CAS minori”), financed by the same ministry. Italy’s commitment not to deport unaccompanied minors remains strong, as is a similar commitment that public officials, public service officers, and entities that carry out acts of assistance must — upon becoming aware of an unaccompanied minor — immediately take action and accompany the child to a reception facility. On the other hand, the most recent legislation has led to the decision to sustain the sectoral policy and has promoted a culture of emergency, as manifested in the opening of CAS facilities without a common directive in terms of the standard of reception and insertion. Such an approach seems to respond more to an organizational dimension in which the child is considered a “migrant” rather than a “minor.” From the perspective of a culture of social intervention, this is an important step that seems to forgo the past approach of the social service sector, where things moved slowly away from large and institutionalizing structures, and from opaque and generalist assistance projects. In the reception facilities, minors are guaranteed every form of protection and care in their best interests, such as room and board, but also an assistance project that includes linguistic formation, education and professional training, health care, and primary socialization. Those placed in centers or in foster families can access the education, formation, and national healthcare systems, and can receive support defined by their legal status — that is, a residence permit for minors, classification of their asylum application, and recognition of their qualifications. They can take advantage of work orientation and socioprofessional integration. Usually, these types of interventions are managed by those in charge of the facilities where the minors are housed under the coordination of the Social Services division of the local municipality, which typically serves as the child’s legal guardian. Often, however, the educational program conflicts with the expectations of the child and their desire to send funds home as soon as possible in order to pay off the debts incurred for the trip. The minors themselves do not only express such an expectation but so do their families, with whom they have constant contact via modern communication technology and Internet (e.g., chat, blog, Facebook, Whatsapp, Skype, Viber, etc.). As a result, the minors abandon the offered education in order to “work” as handymen, in the kitchens of restaurants, at carwashes, doing physical labor at markets, and picking fruit on farms, completely naive to the fact that they are being exploited by their employers who are often fellow countryman or distant relatives. Exploitation can also take the form of abuse and trafficking, which is a particular risk for young girls. For unaccompanied girls, the rule of law is suspended and a different ethic takes its place: to live, they must learn to suffer violence and oppression on a daily basis. Furthermore, field research reveals that proposed types of reception do not necessarily correspond to the needs of the children. This can be seen in the fact that the children voluntarily decide to leave the facilities in which they were received. As was indicated in the first section of this paper, “untraceable” minors who have disappeared from the system are those who, by their own initiative, run away from the care offered by the state and throw away the opportunity of finishing the process of their integration and regularization once they reach the age of majority (among other, cf. CNR-IRPPS and UNICEF 2017). Today’s situation is motivating Italian authorities to propose more practical methods of intervention that would entrust minors to fellow nationals in Italy. Other measures include the prevention of the premature departure from reception centers, cultural mediation, peer education, assisted repatriation, and training border law enforcement agencies to identify victims of trafficking. This course relies on solutions that have demonstrated some difficulties but have proven their potential, and could change the course of imposed homogenization, which is still creating problems in the coordination of the different types of facilities, either in the provision of the services provided or in the guarantee of the time required for first reception and assessment of age. It is necessary to consider how to engage all actors involved with unaccompanied minors, so as to activate procedures of reception suited to the needs of this specific group, and which considers the use of more personalized interventions that take into consideration their additional vulnerabilities, such as psychological distress, exploitation, and trafficking. Migration is a process with inevitable repercussions on the well-being of persons, and which requires the redefinition of one’s own identity and values, as well as the reconstruction of personal, human, and social biographies. This process can include the loss of a point of reference, experiencing inadequacies in human relations, and undergoing social distress. Under certain aspects, migration — as a complex process — is to be considered a traumatic event for the one who experiences it, especially if that migrant is a child. The separation from one’s own living environment, from adults of reference, from peers, and from all the relationships that constitute a secure basis for the development of personal and social identity, can become a difficult ordeal for the psychorelational balance of a child. To take into consideration the whole migratory journey and to go beyond the current moment that the individual is in means to undertake a space-time exploration which is capable of revealing the “why,” the “how,” the “when,” and the various subjective and objective meanings given to emigration as an event and, consequently, in the re-elaboration of these meanings. The accounts of many unaccompanied minors include stories of mistreatment, exploitation, journeys through unknown territories, delays in calamitous places, and the presence of ambiguous persons. They are stories that have in common the failure to have the status of children recognized and, as such, their need for care and protection from the adult world. Such events, which demonstrate sociostructural fragility of identity, can be a source of stress or even trauma with long-term consequences. Many authors speak of a process that can be traced back to the dynamics of mourning, in which the processes of support, elaboration, and reconstruction of past traumatic events must be revisited. In order to develop a process of support, elaboration, and reconstruction, it is necessary to take into consideration the various individual and environmental factors of the migrant — that is, the specific child in question and the situation into which they are inserted. It is important to consider the dynamics of competency and self-efficacy, which can be seen as the foundation of resilience. The concept of competence is an essential element in the theory of personality. It reflects the multiple capabilities of the individual to face problems and to tackle the changing circumstances of life, which include the challenges present in their current situation. These skills reflect not only what we know and therefore transmit (declarative knowledge), but also our habits and the other types of skills that a person naturally puts into action at the right moment (procedural competence). Of course, it is the situation that determines whether or not a competency is useful or not. Some skills are crucial in one context; in others, they become irrelevant since different contexts present different challenges and require different skills. In addition, the migrant’s response to his or her context and the change that this response brings is crucial to his or her well-being. Certain skills are gained after social interaction and observation of the sociocultural world. Certain abilities, which the individual did not possess previously, are learned through new interactions; the change corresponds to the needs and requirements of the context. That is why social agents must procure both intercultural and mediation skills, and why minors who are migrating must be placed in conditions in which they can learn to live and appreciate individual and cultural diversities in such a way so as to acquire specific skills in intercultural dialogue. For social agents, this means acquiring professional skills; for minors in transit, this means acquiring skills in building positive relationships, acceptance, friendship, sharing, and integration. Under this analysis, we consider self-efficacy alongside competence. Often, people fail to attain certain goals even though they possess the necessary skills, or they simply do not engage themselves intellectually or relationally in new challenges. Self-efficacy is a person’s perception of their own ability to act in a situation or to influence the course of events by modifying certain variables, both external and internal. Many studies have demonstrated that people with a higher level of self-efficacy show more curiosity towards new stimuli, tend to react in a positive way to failure, and prepare and choose behavioral strategies that are more appropriate to the context with respect to people with lesser self-efficacy. In addition to being determined by personal skills and competencies, self-efficacy is also the result of social interaction and the feedback that an individual receives. It serves as the basis for the success or failure in carrying out certain tasks. Verbal, behavioral, affective, and relational stimuli are fundamental for the child’s discovery of his own capabilities. Encouragement and stimuli are a strategy to overcome certain failures and personal trauma. For example, if an individual is separated in certain activities on the basis of his alleged cultural or ethnic diversity, or on the basis of his initial poor performance due to the novelty of the context, this could create a situation in which the child, and those with whom they share their relational context, matures in the belief of their own low self-efficacy. These subjective perceptions directly influence a person’s self-image and their behavior. For unaccompanied minors, this process becomes even more consequential, not only in reference to the journey, but also to the relational dynamics that are formed with this context and which provide positive or negative feedback. Finally, all this translates into a process of stimulation and strengthening of resilience, understood as the ability to resist, overcome, and thrive after much adversity. Resilient individuals have the sensation that they are able to control their fates, even if this destiny has given them a devastating blow. They react and respond with what they possess, and use the situation constructively. It is not just personal traits and lifetime experience that affect resilience, but — once again — the dimensions of social relations established within that context which can assist in situations of hardship. Various forms of racism or other types of discrimination in the host society can diminish self-esteem and the ability of minors to develop a coherent and positive sense of self. 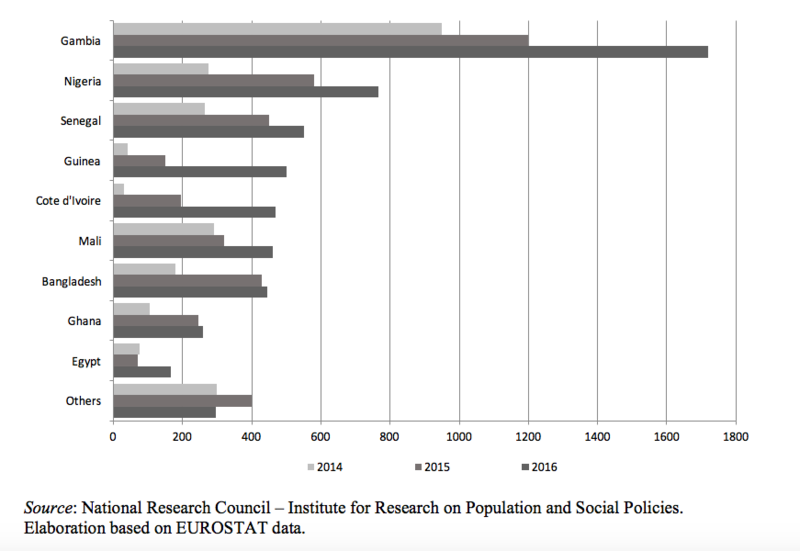 The experience of failure in socialization or the lack of social inclusion (e.g., scholastic inclusion) worsen the migrant’s overall situation. Perceived discrimination is a factor of psychosocial stress, with negative implications for the psychosocial health of these minors, and one that will have an impact on their adult life. Many studies distinctly illustrate the negative effects of discriminatory behavior or attitudes on mental health, which can take the form of depression, social withdrawal, and even juvenile delinquency. The contextual factor is just as important, since it is intrinsically tied to the individual one. A tendency towards a more integrated system in which the individual is seen in reference to the various relational networks in which they are inserted appears to be a more advantageous way to deal with complex social situations and phenomena, particularly those related to the migration of unaccompanied minors. Such a vision has at its core a specific environmental analysis (ecosystem) of the milieu in which the individual is placed. This is even more relevant in reference to children, for whom the relational dimension is constitutive. When it comes to working with minors on the move, the influence of the physical and social surroundings on their behavior and the interdependence between individuals within the context of specific social groups (understood as communities) are aspects requiring the attention of both agents and institutions. Changes in self-perception — that is, in the perception of one’s own effectiveness and competence — is the result of a co-construction of rich and solid histories. This requires the establishment of a relational stability to the situational context, so that this relationship forms the solid base on which it is possible to promote the personal growth of minors by increasing their confidence in the future. By demonstrating with approval and acceptance the success they are able to achieve, new and more complex life goals become more desirable and attainable to them. The environmental factor takes on a real and transformational relevance only if it does not intensify dysfunctional models already interiorized by the minors themselves. Their unwavering need to survive and to overcome difficulties is expressed in both an asserted autonomy and their intolerance to the rules of the adult world, with which they find it difficult to establish bonds of trust and to which they may respond with social withdrawal and even violence. For this reason, the presence of specialized agents knowledgeable in the socio-cultural context of the country of origin and the dynamics of psychosocial development are the basis for establishing a meaningful, trustful and strong relationship. The milieu is therefore structured as a place that welcomes, protects, cares, promotes, and integrates. The host community must be formed in the light of the best interests of the child, and with particular attention to the individual needs of each child. Overcrowded communities that disperse attention and the continual change of figures of reference naturally lead to disengagement. Only in a nurturing community will everyday life assume a structural meaning, capable of supporting in minors processes of constructive self-consciousness, of strengthening their own identity, and of relating to the surrounding reality. To empower means to restore subjectivity and individuality, but also to restore the ability to see one’s self as an actor in a relational context in which personal and social identity can be strengthened. As a result, the concept of participation refers to the commitment and responsibility of the individual within a relational context geared towards achieving a collectively determined goal. It is a process in which the subject actively takes part in the decision-making process and the dynamics that concern them or in which they are involved. Participation brings about in the child openness to collaboration and cooperation, stimulating changes at the cognitive (amendment of stereotypes), affective (perceptive), and active levels. The phenomenon of unaccompanied children and young people who become adults after arriving in Europe calls into question not only juridical/legal, policy, and governance issues, but first and foremost, ethical and social considerations (Di Lorenzo 2014; Human Rights Council 2016). There is a substantial body of law and standards on minors in matters of asylum and migration at the international level, and it has been integrated into European legislation. EU legislation recognizes children as applicants for international protection in their own right and defines procedural guarantees and protection measures. The most recent proposals attempt to address the gaps identified in current legislation like the need for a revision of the principle of the “best interest of the child”; the need for more effective protection and treatment provisions; the need to protect minors from the moment of their arrival; and the need to train staff (including those of border agencies) who directly interact with children. The “best interest of the child” is the guiding principle of all the legislation regarding child protection, and it ensures that, in all decisions concerning minors, the legislator or adjudicator takes into account the child’s best interests. Therefore, every judicial decision is geared towards promoting the psychophysical well-being of the child, and privileging those aspects that are more favorable for their balanced growth and development. This rule demands that the rights of adults must yield to the rights of children. The rights of adults, with regards to family, acquire a “functional” scope for the protection of the child (who is the weaker subject within the relationship), and therefore in need of greater protection. The unaccompanied minor experiences traumatic fragility due to separation or the events that have shaped their situation, and therefore requires a higher level of protection. Whether one takes into consideration the country of origin, country of transit or that of destination, it is necessary to adopt an unambiguous approach to the human rights of minors and to assume shared responsibilities at the European level for their protection. Human rights of children are not proper only to one nationality, and nor do borders define them. The “best interest” of the child constitutes a basic standard in the decision-making process and in actions undertaken on behalf of individual minors, whether at the national, European, or international levels. The right to life, the right to survival, and the right to the best possible development of the well-being of children and adolescents are the rights of all minors, including unaccompanied or separated minors. As such, they are to be given the maximum protection with regards to their lives, as well as the possibility to grow and develop integrally through access to the necessary economic and social resources, so as to be able to reach their maximum human potential. If, on one hand, both European and Italian jurisdictions have espoused the principle of the “best interest of the child” at the level of implementation, they still experience many difficulties at the level of intervention. First, the evaluation of a child’s best interests and the evaluation of what elements are key for the achievement of a child’s psychophysical well-being require the presence of capable specialists in both places of arrival and of transit. Furthermore, the identification process of the child and the consequent allocation to a specific reception center cannot be entrusted to general protocol or norms of identification applicable to all migrants. Such general norms and protocols are already lacking in reference to adult migrants, and even more so, are lacking in reference to the greater fragility of child migrants. The first priority must be the assessment of a minor’s state of health, even before the identification process, which is a legal aspect for the host country. Well-being should not be solely understood as the physical health of an individual, but it also entails their psychological state. Consequently, there is need for dialogue with experts and it may require a longer period of time to accurately diagnose the condition of the subject. From the perspective of international cooperation policies, shared responsibilities, and the reception and solidarity obliged by the human rights of children, it is recommended that each member state follow the minimum principles of protection of unaccompanied minors, which could be summarized as follows. (1) With regard to the country of origin, the legislative, administrative, financial and political commitments must be strengthened in order to prioritize the rights of minors; to address the gaps in basic education and training requirements such as education and vocational training; and to provide specific social protection against all forms of marginalization, poverty, violence, and discrimination. The basic reasons for leaving one’s home country unaccompanied should be addressed. Local, national, regional, and international protection systems should be revised and strengthened. In a majority of cases, the problem is not so much the lack of legislation or programs designed to protect child migrants, but rather the lack of efficacy in their application, or the lack of an effective readiness of funds for their implementation and sustainability over time. (2) Plan and implement migration policies that are guided by a child’s best interests, and ensure that there is specific funding for matters regarding the migration of minors. Shared action should be based on human rights, and should take in to consideration the financial, social, cultural, and administrative aspects of child migration. In particular, it should aim to prevent the trafficking and exploitation of minors, as well as any other forms of exploitation for illegal purposes, or abuses to which children may fall victim. (3) Adopt international standards in the protection of the rights of minors at the national level, and revise practices and laws that are obsolete. Many countries of origin are still lacking with regards to the laws established by the Convention on the Rights of the Child. For example, the legislation regarding expulsion and the procedures to follow in its implementation are not often specifically mentioned in the legislation of many African countries of transit. At the same time, legislation that aims to protect minors does not take into consideration the particular situation of unaccompanied minors; even in cases of more clearly defined legislation in terms of rights protection (such as the case in the recent revisions of Italian law), there are still normative gaps that have very tangible consequences in the care of young adults coming of age who have left the protection system of minors and are suddenly “by themselves” without the necessary autonomy or competencies necessary, and therefore fall into situation of social marginalization and illegality. (4) Eliminate disparities between the living conditions of unaccompanied minors entrusted to institutions and their fellow peers with which they interact. Unaccompanied minors should not live in situations of discrimination and marginality solely due to their migratory status. They are individuals that require special attention because of the traumatic fragility that has marked them; yet at the same time, the social care they receive should not transform into a type of “institutionalization.” The effect on the development of the migrant’s identity, which the stigma of being taken under the care of social services leaves behind, must be considered. (5) Establish commissions that permit countries of origin, of transit, and of destination to meet and discuss mutual matters and problems of common interest in order to coordinate together in the provision of efficient care and to increase the efficacy of the protection of the rights of unaccompanied minors. (7) Develop policies to train personnel at all levels of migration and reception. Personnel should be specifically trained to interact with children and must be competent in the protection of the rights of minors. Furthermore, every member state of the European Union should promote programs of formation for all public border agency officials in reference to the interaction with, and the provision of care for, unaccompanied minor migrants. (8) Guarantee that reception centers have distinct and secure housing (with specialized personnel) for unaccompanied minors. (9) Establish specific programs for unaccompanied minor in centers and reception communities which are geared towards the relational and social integration of child migrants, their interaction with peers, their insertion into the educational and formational system (including language classes), and offering support in training, educational programs, and the preparation for independent adult life. (10) Strengthen empowerment and restore the ability of minors to perceive themselves as actors in a relational context, so that they may be able to strengthen their personal and social identity. (11) Prepare and provide information to child migrants which is adapted to their age and cultural upbringing, uses simple and clear language, and is supported by the assistance of interpreters and linguistic mediators. (12) Rapidly and efficiently process asylum applications made by unaccompanied minor migrants and ensure that these applicants, in the meantime, are housed in communities that meet international standards as understood by the human rights of a child. (13) Monitor the integration process of unaccompanied migrant minors in their country of destination, in coordination with the first country of arrival and the country of final destination (if different), in order to support their transition into adulthood in their new social context and to ensure a solid and positive social integration process. (14) Offer continued support to young adults coming of age if the process of their formation and integration, initiated as a minor, has not yet reached a satisfactory level of insertion into the social, relational, professional, and communal systems. (15) In the design of policies and programs, take into consideration the different categories of unaccompanied minor migrants and their specific characteristics and stories, so as to promote their human rights, while never abandoning a holistic approach to the rights of children in general. As member states of the United Nations formally negotiate both the Global Compact on Refugees and the Global Compact for Migration, they should incorporate these recommendations into the documents as best practices for responding to the needs of unaccompanied children so that they are protected by and can integrate into their new societies. About 8,000 were received in Italian municipalities during this period. In this regard, mention should be made of the initiatives of the Ministry of Labor and Social Policy regarding “aid” and job grants. CNR (Consiglio Nazionale delle Ricerche)-IRPPS (Institute for Research on Population and Social Policies) and UNICEF (UN Children’s Fund). 2017. Sperduti-Storie di minorenni arrivati soli in Italia. Rome: UNICEF. https://www.unicef.it/Allegati/Bambini_Sperduti.pdf. Di Lorenzo, Nadia. 2014. “Il superiore interesse del minore sottratto supera l’applicazione della Convenzione dell’Aja 1980.” In Rivista del Diritto di famiglia e delle persone. https://www.unikore.it/index.php/numero-4/di-lorenzo-nadia. EMN (European Migration Network). 2015. Policies, practices and data on unaccompanied minors in the EU Member States and Norway. Synthesis Report. https://ec.europa.eu/anti-trafficking/publications/policies-practices-and-data-unaccompanied-minors-eu-member-states-and-norway_en. ———. 2016. EMN Annual Report on Immigration and Asylum 2015. https://ec.europa.eu/home-affairs/what-we-do/networks/european_migration_network/reports/nationalreports_en. Étiemble, Angélina. 2008. “Parcours migratoires des mineurs isolés étrangers, catégorisation et traitement social de leur situation en France. ” E-migrinter (2): 180-85. Giovannetti, Monia. 2008. L’accoglienza incompiuta: le politiche dei comuni italiani verso un sistema di protezione nazionale per i minori stranieri non accompagnati. Bologna: Il Mulino. Giovannetti, Monia, ed. 2016. Minori stranieri non accompagnati. Rome: Anci-Cittalia. Giovannetti, Monia, and Marco Accorinti. 2017. I minori stranieri non accompagnati tra accoglienza e integrazione. Minori Giustizia 3: 96-105. Human Rights Council. 2016. Global issue of unaccompanied migrant children and adolescents and human rights. UN Doc. A/HRC/33/53. Geneva: Human Rights Council. SPRAR (Sistema di Protezione per Richiedenti Asilo e Rifugiati). 2016. Rapporto sulla protezione internazionale in Italia 2016. Rome: SPRAR. ———. 2017. Rapporto sulla protezione internazionale in Italia 2016. Rome: SPRAR. UNICRI (United Nations Interregional Crime and Justice Research Institute) and PARSEC. 2010. Trafficking of Nigerian Girls in Italy: The Data, the Stories, the Social Services. Torino: UNICRI and PARSEC. http://www.unicri.it/documentation_centre/publications/series/docs/trafficking_nigeria-italy.pdf. UNHCR (United Nations High Commissioner for Refugees). 2017. “Italy weekly snapshot – 31 Dec 2017.” https://data2.unhcr.org/en/documents/download/61461. In this essay, Sergio Carciotto of the Scalabrini Institute for Human Mobility in Africa (SIHMA) examines South Africa’s temporary labor migration laws and how they apply to migrant workers from Zimbabwe. Carciotto makes the case that low-skilled workers, such as Zimbabweans, are not provided the benefits that high-skilled workers receive, particularly the opportunity to become permanent residents. As such, they are without leverage in the workplace and are subject to exploitation. Carciotto concludes that low-skilled workers who enter on a temporary basis should be allowed to apply for permanent residency after a certain time, in order to avoid situations of indentured servitude. In other words, the longer a worker remains, “the stronger their claim to full membership in society and to the enjoyment of the same rights as citizens.” He also states that such a policy should be included in the Global Compact on Safe, Orderly, and Regular Migration, currently being negotiated by United Nations member states.